When the enamel must be removed due to extensive damage, a crown that completely covers the tooth is used for best protection and strength. These crowns have the beauty of natural teeth or veneers. 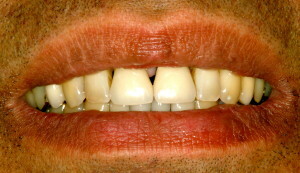 There are many choices for porcelain crowns or “caps” in modern dentistry. Crowns can be lined with gold for strength or an all-porcelain, metal free crown may be used. The unsightly black line at the gumline will not happen with either method due to the new technology available. The choice will be customized for you based on many factors such as durability, function, and beauty. The office procedure and laboratory time is similar to the porcelain veneer process. If you have badly broken down teeth or old crowns, this new technology can give you natural, brighter teeth. Schedule a Cosmetic Consultation or Dental Exam Today! I am the type of person who does not enjoy going to the dentist at all! 😉 In fact, it had been 2 years since my last dental appt in the City. I recently moved to Napa and needed a dentist…I found Dr Lamberton (from a person I met at the car wash…lol…and on Yelp!) and I booked my 1st visit. He was professional, thorough, very personable and very kind to me. I liked how technologically advanced him and his team are…from text reminders about appts, to full computer views of your teeth and gums made me feel like I was getting care from people who care. Nicole, who works the front desk is a wonderful person! She made me feel very welcome, comfortable and at home…the person who welcomes me into a professional practice is so vital to my “feelings” and experience…Nicole is a great face of Dr Lamberton’s practice and she makes me feel special every time I see her. My experience with the hygienists was great. I am very sensitive to pain and they were gentle in the approach and from what I can tell, very effective. I had to have a deep cleaning done ( I was dreading it!) and other than it taking a long time, there was only some minor discomfort during the numbing process…that was it! All in all…I would recommend Dr Lamberton’s dental office without hesitation to anyone who needs a dentist or is thinking of switching dentists! Located at: 3434 Villa Lane Suite 120, Napa, CA, 94558.